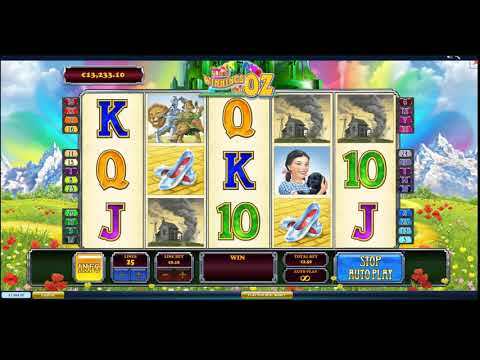 The Winnings of Oz is a slot game that the developers at PlayTech created after being inspired by The Wizard of Oz movie. With the Emerald City and yellow brick road in the background, Dorothy, her new friends and cuddly dog Toto spin on the reels. Let the themed bonus features, free spins and super spin wheel increase your balance as you search for the Wizard of Oz. The Winnings of Oz is a 5 reel slot that has 25 paylines. There are two bonus games, the Yellow Brick Road and the Wizard Bonus as well as a round of unlimited Free Spins. The round starts when symbols of the yellow brick road land on the first, third and fifth reels. The meandering road to the Emerald City with multipliers in each section appears on a new screen. The further Dorothy advances, the higher the multiplier becomes. Along the way you can meet the Tin Man, the Lion and the Scarecrow. Each of these new companions adds to the winning amount. In the right corner of the screen there is a reel. You need to click the Spin button below it to advance along the road. Your goal is to reach the Emerald City, where you will launch the second bonus round. If you are playig for real money and your bets are high, you will see the Progressive Jackpot image along the path. If you manage to reach this section, big winnings are guaranteed for you. The second bonus game is the Wizard Bonus. You can launch it in two ways, either by reaching the end of the yellow brick road in the previous bonus feature or if the yellow brick road symbols land on the 1st and 3rd reels and the Wizard Bonus symbol lands on the 5th reel. In this game you have to select 4 coins that will uncover portraits of Dorothy, the Scarecrow, the Tin Man and the Lion. For each character, the Wizard of Oz will reward you with a multiplier up to x1,000. If you manage to collect all four characters, you will receive the progressive jackpot. In The Winnings of Oz you get free spins, when three symbols of two witches and the words 'Free spins' appear on the second, fourth and fifth reels. If more of these symbols appear during the round, additional spins will be awarded. Symbols of the Good and Wicked Witches may appear on the reels in this round and they can create their own combinations. Additionally, the Good Witch is the Wild symbol that can replace all others to complete winning combinations. The Wicked Witch is the Scatter and if 5 Wicked Witches appear the free spins will finish and trigger the final super spin. During the round the symbols of these two Witches are collected and when the free spins have finished and the super spin starts, the Good Witch symbols will be added to the wheel to increase your chances of getting a big win. The Winnings of Oz has a fairly wide range of settings that you can make using the buttons on the control panel. Using these buttons you can open the paytable, which shows the payouts for winning combinations and describes the game features, choose up to 25 active paylines, select the amount of the line bet from 0.01 to 0.40. These numbers will be multiplied to show your total bet per spin. There is a progressive jackpot counter displayed above the reels. You can spin the reels in two different ways, manually using the spin button or automatically via the auto play button. You can choose from 10 to 99 automatic spins which can be stopped if you press the stop button that replaces the spin button. There are 10 symbols that can create winning combinations if 3, 4 or 5 identical symbols appear on neighbouring reels, from left to right along a payline. These symbols are the logo of the slot, Dorothy and Toto, the Scarecrow, Tin Man and Lion together, the heeled shoes and a picture of a Tornado about to hit a house. Besides the pictures with multipliers that earn you winnings, The Winnings of Oz features special symbols as well. The logo not only has the highest multiplier but acts as the Wild symbol so it can replace any other symbols on the payline to complete winning combinations. Two other special symbols are the bonus symbols of the yellow brick road and the Wizard of Oz. As described above If three of these symbols appear in a certain way on the 1st, 3rd and 5th reels the bonus games start. Another special symbol is the Scatter which has a picture of the Wicked Witch and starts the round of free spins. The Winnings of Oz has a large number of bonus games and free spins and the chance to hit a large jackpot if you play for real money. You can play this slot for free in its demo version at NeonSlots.com or try other Wizard of Oz slots World of Oz and Wizard of Oz - The Road to Emerald City.